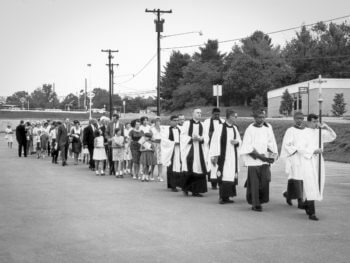 On August 7, 1966, a group of people met in the parking lot of Reynolda Manor Shopping Center and walked up Fairlawn Drive to the site of what would be St. Anne’s Episcopal Church. What was unusual about this procession to the groundbreaking ceremony was that it comprised black people and white people who had been worshipping together for over a year. 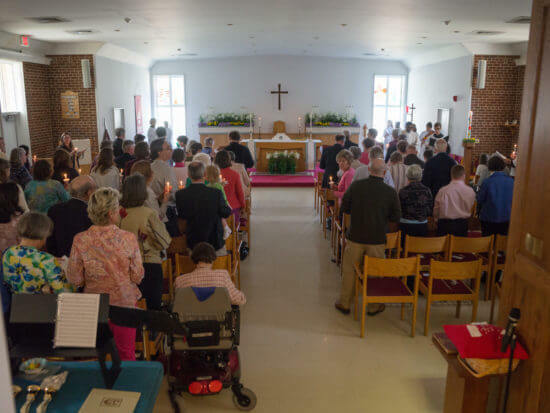 Bishop Thomas Fraser had assured that this would be a different kind of Episcopal church when he invited members of Winston-Salem’s three existing parishes to leave their churches and lead the new mission. This made St. Anne’s intentionally racially integrated from the beginning in Winston-Salem, North Carolina, one of the most segregated cities in the United States at that time. From May 1965 until early 1967, St. Anne’s met at the Old Town Civic Club. Women wore hats to the worship services or were provided with doilies to cover their heads. Even though our name–St. Anne’s– was chosen in part to honor the fact that women had recently been allowed to serve on vestries, the invitation to serve as acolytes during services was only extended to boys, and the invitation to serve as lay readers requested men only. A chapter of Episcopal Church Women (ECW) was started. 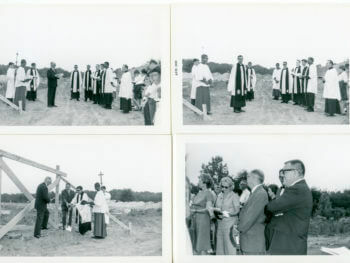 The groundbreaking in 1966 was for what was intended to be the first building of a typical Episcopal church campus consisting of a sanctuary, parish hall and education building. All of this changed fairly quickly. Casual dress was adopted. Girls learned to be acolytes. Women became lay readers and served on the governing mission committee. The ECW chapter died out for lack of interest. St. Anne’s decided that it wouldn’t have any women-only or men-only groups. The building, designed to be the parish hall and intended for only temporary use as the sanctuary, has been the place where St. Anne’s congregation has worshipped from 1967 to the present. Until 2006, it was the only building on the site–serving as sanctuary, parish hall, church offices, Sunday School, child care center, kitchen, and a Forsyth County polling place. What might have surprised the architects is that the long-awaited second building was not a sanctuary, but a new and improve parish hall. For 40 years, the ritualistic folding and unfolding of metal chairs in the sanctuary was a prominent feature of this life in community. Parishioners set up chairs for each service–in the round for some years, in conventional rows in others. The chairs had to be stacked against the walls at the end of the service, unless there was to be a lunch in that multipurpose room, or an agape or picnic on the lawn, where the chairs would be set up again. These space considerations seem to have aligned with countercultural trends that were sweeping the country in the 1960s. That freed-up, pared-down quality extended to many facets of the worship service and community life. 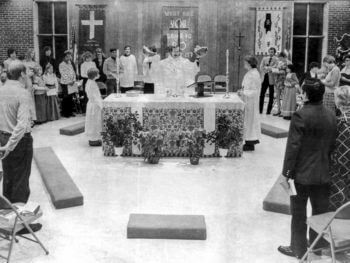 Handcrafted hangings and clerical vestments, homemade bread for communion, bottles of wine on the tables at potluck suppers and noon-time agapes, autoharps and guitars for music, and little children included in everything, were some of the practices that made St. Anne’s different in its first few decades. St. Anne’s willingness to try something new, and be the first to give shape to emerging ideas and respond to emerging needs, continues today.